Thin is in at IDF this year. Read on for a look at Intel's Ultrabooks, thin-ITX motherboards, and the new X79 chipset. Don't forget to read IDF Day 1 Recap and IDF Keynote: Intel is Carrying the PC Torch. It’s mobile day at IDF, and Mooly Eden of Intel kicked off the keynote with more discussion of Ultrabooks. Any perceived tension between Intel and Microsoft melted away, at least for a time, when they Windows 8 trotted out running on Intel hardware. The Ultrabook phenomenon is an interesting one. 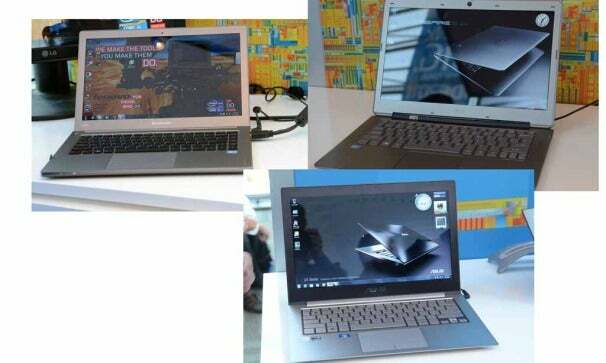 Intel is pushing OEMs to develop Ultrabooks, which actually are required to be branded properly. So you’ll have Toshiba Ultrabooks, Lenovo Ultrabooks and so on. While they’ll likely have distinctive model numbers, they’ll all have an Intel Ultrabook badge on the units. Intel is certainly promoting Ultrabooks heavily, and it’s tough for an OEM selling PCs on thin margins to turn down money from Intel in exchange for a logo. 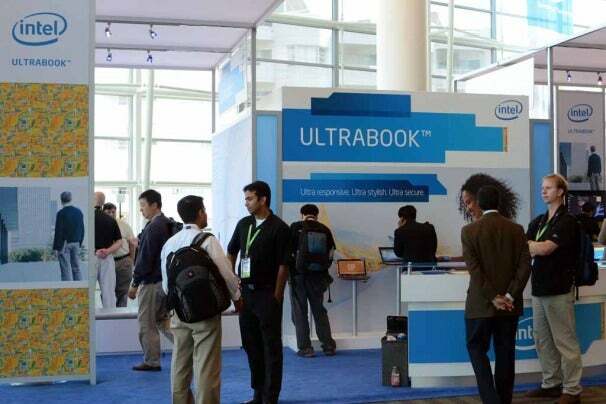 Intel had a big booth dedicated to Ultrabooks, showing off a variety of units. Ostensibly, Ultrabooks compete with Apple’s Macbook Air, but a direct comparison isn’t really apt. The Ultrabooks we saw we’re a little thicker in the rear of the unit, because they had Ethernet and VGA jacks built in. The Air, on the other hand, lacks both, so the unit is slimmer because of it. 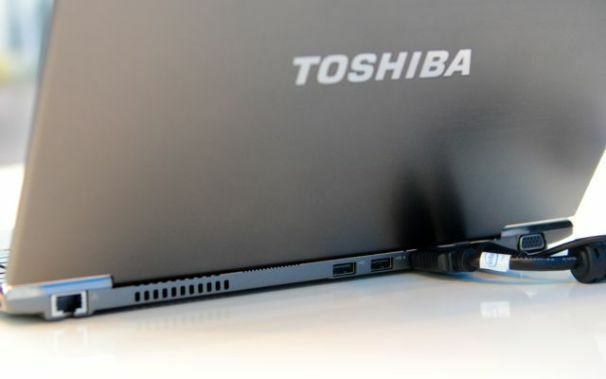 This Toshiba Ultrabook shows the real estate consumed by Ethernet and VGA connectors. That said, there is undeniably a market for a very thin, highly mobile laptop running Windows and capable of working in a business environment. Ultrabooks are a welcome addition in a world of Windows laptop that seem to be almost all 15.6 inch, seven pound units. But Intel can't forget about the desktop PC. Even as the majority of PC sales shifts to mobile PCs, the need for desktops still exist. However, the style of desktop systems is changing. Intel showed analyst numbers that indicated standard tower PC sales shrinking by 4% over the next several years. Small form factor systems – which are still discrete PC boxes that require separate display – will grow 11-13%. All-in-One systems in which the PC and monitor are merged into a single unit, will grow by well over 30%. While Apple is likely most responsible for popularizing all-in-one PCs with their iMac line, HP and others have also seen significant success in recent years. Intel is trying to accelerate the process by developing a standard platform for all-in-one systems. The first stab is something Intel calls “thin ITX”, a motherboard built around the mini-ITX form factor motherboard, but very low profile. 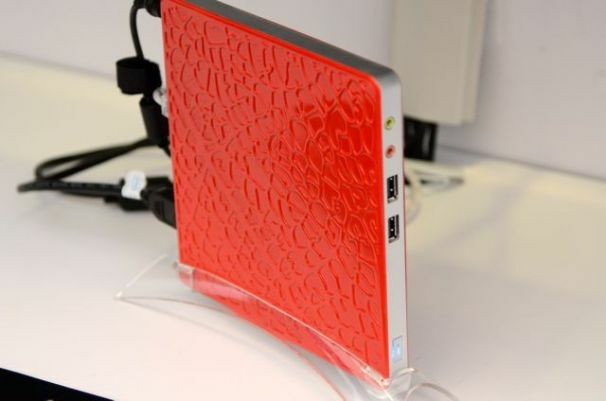 The thin ITX form factor allows manufacturers to build ultra-skinny form factor PCs. 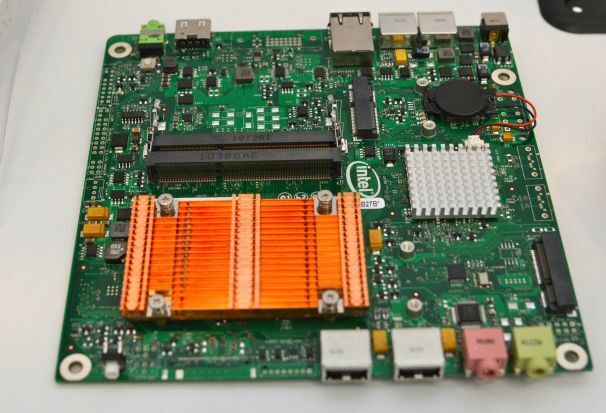 Note that while you can build all-in-one PCs with this type of motherboard, there are other possibilities, like a PC roughly the size of a double thickness CD case. A really thin PC capable of driving 1080p HD video. This particular unit is built around Intel’s next generation Cedar Trail Atom processor. That actually illustrates a limitation of thin ITX: it’s going to be limited initially to Atom class CPUs. However, given that Ultrabooks will be migrating to Ivy Bridge, we can hope that Ivy Bridge class CPUs will eventually show up in ultra-compact client PCs, too. I dropped by the MSI booth and had an good chat with Alex Change and Rajiv Kothari of MSI’s marketing team. As with Gigabyte and Intel, MSI will be rolling out boards based on Intel’s X79 chipset and capable of running the upcoming Sandy Bridge Extreme CPUs. Chang went to great lengths to describe how MSI X79 boards, as well as a number of their current Z68 motherboards – are PCI Express 3.0 capable. They use router chips capable of handling the full PCI Express 3.0 bandwidth. 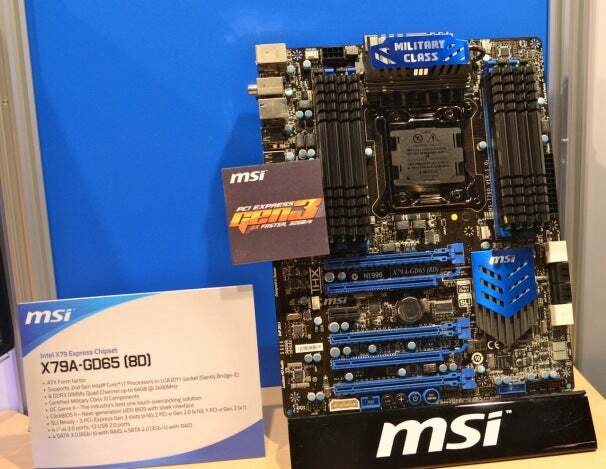 As with the other motherboard makers, MSI will offer a range of boards with four and eight memory sockets. If you’ve got the right kind of DRAM modules, an 8-slot board can be loaded up with 128GB of DDR3. Higher end boards will incorporate features for performance enthusiasts such as a minimum of four PWM fan monitor headers, a slick EFI BIOS with graphical user interface (which even allows you to take BIOS screen shots) and military grade capacitors. MSI will be offering a broad line of X79 boards for gaming and performance enthusiasts. Between Ultrabooks and X79, Intel seems to have the PC covered. In the post-PC universe, though, Intel is looking forward to building their technology into other classes of products. The Google announcement was a hint of what’s to come. We’ll discuss the implications and potential products in the next IDF report.